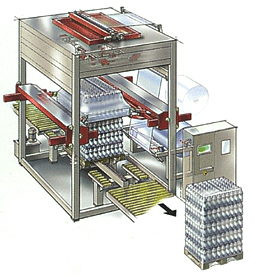 Multi-Layer Co-Extrusion Films maintain the integrity of packaging. Flexible stretch film (FSF) is used to secure the goods on the pallet for transportation and storage. It could help to prevent from damage and reduce the loss. FSF is produced by co-extrusion charge. Film tube with angle folder, which could be extended to 150%. If there are any inquiries, it is welcome to contact us at any time. Flexible stretch film (FSF) is used to secure the goods on the pallet for transportation and storage. It could help to prevent from damage and reduce the loss. FSF is produced by ...... Film tube with a angle folder, which could be extended to 150%. Goods on the pallet could be placed outdoor under raining and sunshine. FSF could effectively protect the goods on th pallet from dust and moisture. FSF could be pulled and extended through equipment or from the wrinkle folder area. After pulling the FSF, visually decide the height of goods,extend the FSF andthen make bags. To decide the extension of the FSF, it is according to size of goods, FSF flexibility, and film folder size. Laminated processing range from one time to many times in general and it will costume more energy. Co-extrusion is to use a variety of materials to paste them together during melting of the manufacturing process. As a result, it can reduce processing times and save more energy and costs. Without any adhesive, Interlayers are bonded together by melting. As a result, there is no residual solvent. Added filler or color master batch can be added to the non-inner layer and these additives are not in contact with food. Therefore, food safety and health can be protected. Deterioration of food quality is induced by microbial proliferation, chemistry and physical changes. 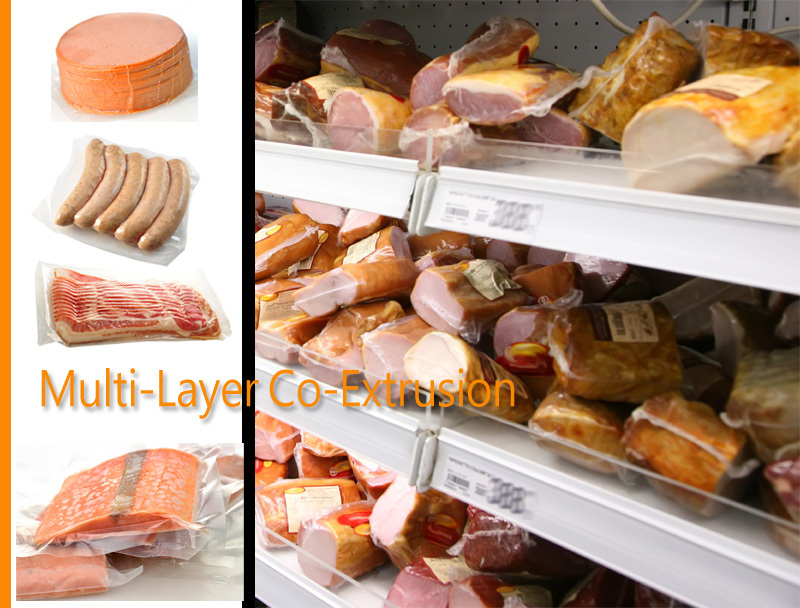 With gas barrier and fragrance protectiveness, high barrier packaging materials can slow down the deterioration of food quality and extend the expiration date for processed food like a slice of ham, tea, coffee, dried fish, ketchup, mustard, cake and other packaging. After food being manufactured, nutrition quality will be gradually reduced by the increase of oxidation and the losses of vitamin materials. But high barrier materials can decrease and even protect the nutrient losses in order to slow down and even prevent the generation of oxidized materials and maintain the fresh quality of products. In order to keep product quality, anti-oxygen, preservatives, pigment, spices, vitamin C or artificial additives are added on food. By using high barrier and food technology can decrease the usage for addition. For example, high barrier materials can be used for dried tofu to decrease preservatives usage. Also, chemistry pigment can be replaced by natural pigment for jelly at room temperature so as to protect vitamin C. Pickle color can be kept by using the high barrier materials. Microbial Decomposition: germs, yeast and mildew grow and make products corruption and abnormal fermentation then. Packaging materials can be used to avoid O2 generation or use heat sterilization, refrigeration, freezing treatment for prevention. Physical Change: it is caused by dry and hygroscopic factors. For example, powder or a solid product becomes caking hardening due to the moisture absorption. The replacement of the product moisture and the moisture in the air lead the quality change. Then we can use packaging material to block moisture out of the package as well as add moisture absorbent in the package. Chemistry Change: pigment or fat foods containing is easily oxidized in direct sunlight, the light or high temperature occasions Food packaging in quality change can prevent O2 generation and block the light and ultraviolet radiation. From food manufactured to consumers, it will counter some touch contamination like human hands, peripheral appliances and microbial attachment. Food packaging can prevent the food poison from second pollution generated by germs and protect sanitation. Food packaging must be convenient for handling and appropriate to meet the circulation, transport rationalization and adaptability in order to reduce the cost of transportation circulation. Beautiful packaging can enhance consumers’ desires and add to the product value such as packaging design and printing. Product packaging needs to meet consumer convenience like appropriate packaging unit and easy to open and take. We choose product packaging materials to meet up environmental protection needs. Use materials which can recycle, reproduce, reduce the volume of garbage or can completely burn up in incinerators. Milk, soy bean milk, oil, soy sauce, vinegar, juice, ketchup, tea, coffee, alcohol, mineral water, developer, detergent, chemistry medicine and other business packaging. Cold and hot filling and aseptic packaging. Can manufacture vacuum bag or deep draw for 25mm, 40mm and 80mm vacuum bag. Dried fish, mullet roe vacuum packaging. Chinese sausage and ham sausage circulate at room temperature. Can be used directly or bonded with other printing film for use. KOP, KNY KPET and others containing Alfoil material are replaced with other lamination films. Biscuits, dried tofu, dried fish floss, floss, preserves and other items needed for high gas barrier packaging. Gas Barrier Made 3-side seal bags as air tight inner bag of barrel or box. Use for industrial purposes, powder, granular such as chemicals, feed, pharmaceuticals, fertilizers and other products. Resistant Seal without Leaking Inclusions Seasoning oil packaging of instant noodles can be reused to laminate again for emulsion packaging such as shampoo, cleaning agents. Stable Dimension and Easy Processing for Pipe Inside and outside film of the toothpaste tube and all kinds of ointments, cosmetics, laminated hose. Moisture Resistance Replace single layer of PP film. With better packaging, it is suitable for fast packing, which can keep bread or vegetables, and fresh fruit. Easy to Tear After being laminated, PS, PVC, PET, PP and other plastic containers become the heat sealing layer of plastic containers’ lid material. Use for the Retort or Boling and refrigerated products which are easy to tear the lid. Easy to Tear For PC, acrylic, glass, aluminum, stainless steel surface protection.